Among the benefits of living in the United States, and in particular the Southwest, is the visibility of some of the most beloved and photographed birds on the planet . . . hummingbirds. 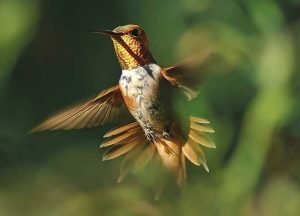 Above: Rufous hummingbird. Photo by Dan Williams. Native to the Americas, the largest number of species of these diminutive birds occurs in the tropical areas of South America, but a number of them can be found in the Desert Southwest. There are over 20 species in North America, and New Mexico is among the nation’s hot spots for hummingbird viewing with 17 species documented. Half of those are commonly seen, while the others are considered rare.The four most common are the black-chinned, broad-tailed, calliope and rufous. While they are the second largest group of birds on the planet, hummingbirds aren’t taking up a lot of space. They’re small. Really small. So small in fact, they include the tiniest birds of the avian world. It doesn’t matter whether it is the largest or smallest hummingbird, they’re all slight in size and are so light they are capable of perching on the thinnest of branches. Some weigh less than a penny, but even the largest will tip the scale at just 20 grams (28 grams equals an ounce). With over 300 species, hummingbirds are second only to flycatchers – which number over 400 species – in overall diversity in the avian world. Indigenous only to the Americas, hummingbirds can be found from Alaska to Chile and Argentina in South America, including the Caribbean. 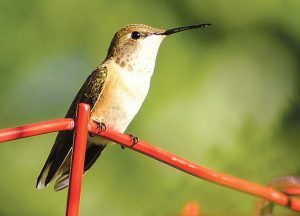 In New Mexico, hummingbirds can be found statewide, especially during the summer months, but the largest diversity is in the southern part of the state. “New Mexico is a great place to bird watch,” said Peggy Darr, nongame avian biologist with the New Mexico Department of Game and Fish. “When it comes to hummingbirds, the best location for overall diversity is the southwestern part of New Mexico, but the entire state can produce large numbers of migrating hummingbirds during the spring and fall. Female broad-tailed hummingbird. NMDGF photo by Dan Williams. And when it comes to feeding, these birds are heavyweights. Hummingbirds spread pollen and pollinate plants by feeding on nectar. They have tongues specially designed to pull nectar from flowers, although they’ll also take flying insects and spiders for protein. Depending on the species, some will consume up to three times their body weight each day. With the average North American human weighing in at 180 pounds, that would be an equivilant daily diet of 540 pounds per day, and yet hummingbirds don’t gain weight. Depending on conditions and what the birds are trying to accomplish, their wings can beat between 50 and 200 times per second with an average heart rate of about 1,200 beats per minute. As a result, they need to take approximately 250 breaths per minute. In contrast, a typical healthy human at rest takes about 12 to 20 breaths per minute. A hummingbird workout for a human would mean certain death. But the hummingbird is built for this level of activity. Proportionally to the body size, a hummingbird’s heart is five times the size of a human’s and this adaptation allows for the birds to accept and distribute oxygen throughout the body while being able to handle a high level of activity. These birds also can function at a body temperature about 8 degrees higher than a human. A rufous hummingbird perches on a backyard feeder. NMDGF photo by Martin Perea. A broad-tailed female hovers in front of a penstamon flower. Spring and summer are the best times to catch a glimpse of this bird in most of the state. NMDGF photo by Dan Williams. Human ingenuity has allowed for the duplication of some of the amazing feats previously seen only in wildlife. Hot air balloons aside, just over a century ago birds, bats and inscects were the only creatures that could sustain flight. Watching birds had humans dreaming of flight and the plane was born. And it wasn’t until the creation of helicopters that hummingbirds were joined in having the ability not just of flight, but also of moving forward, backward, sideways and hovering. The hummingbird, however, also has the ability to be inverted. The key to their vast repertoire of in-flight skills lies in wing design. 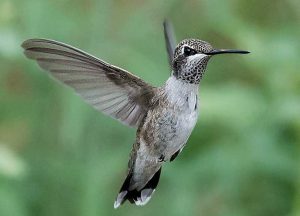 About 25 percent of a hummingbird’s weight lies in the muscles most responsible for flight, and they are able to rotate their wings approximately 180 degrees to achieve a desired action. 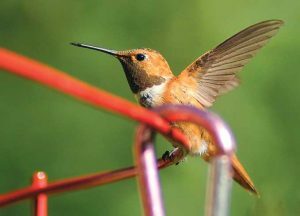 Hummingbirds may fall into the bird family Trochilidae, meaning “small birds,” but they are large in stature when it comes to environmental health. Darr said hummingbirds are attracted to all brightly colored flowers, but red flowers are particularly enticing. 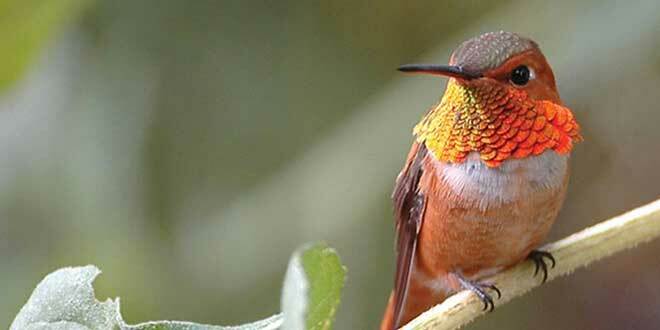 It is believed that more than 150 plant species depend on hummingbirds for long-term survival. Hummingbirds have little to no sense of smell, so a flower’s scent plays no role in their willingness to approach and feed. Color is the sole attractant. 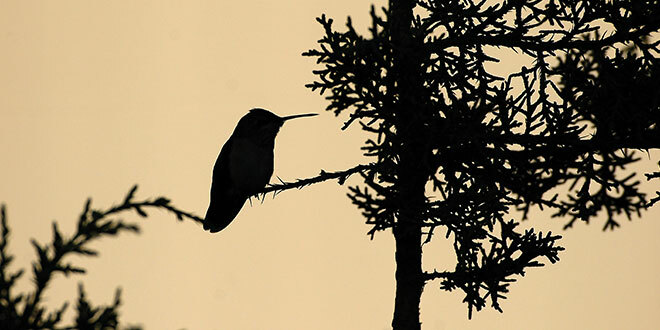 Above: : A silhouetted hummingbird. NMDGF photo by Dan Williams. Females are much more difficult, and sometimes nearly impossible to identify by sight. As with a good portion of the avian world, the males are more colorful, making it easier to figure out what species is being viewed or photographed. However, even with males, the way the light is hitting the bird is important. The reason for this is that the feathers act a bit like a flat bathroom mirror and the direction at which light hits the feathers will result in a variety of appearances. Have a field guide handy, Darr suggested. Feeders with red flowers will produce the best results for those wishing to attract hummingbirds. There are a number of good food products available, or you can make your own. Using only pure cane sugar, mix four parts water to one part sugar and make sure it is dissolved completely before placing it out for the hummingbirds. It’s important to clean the feeders regularly. A better option is to plant native flowering vegetation. 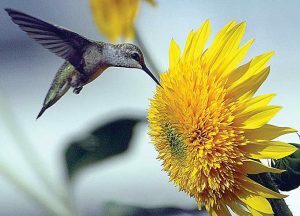 Hummingbirds are attracted to a number of plants native to New Mexico and will visit as long as the plants are flowering. Visit a local nursery to discuss your options. With any luck, you’ll have an opportunity to watch these small, agile birds and begin to understand that their value in nature is substantially larger than their body size.